When General Electric C.E.O. Jeffrey Immelt held a press conference in April to announce the company’s move to Boston, he attested that the new headquarters would have a GE logo that “you could see from Mars.” With renderings of the new Fort Point building released last week, it is apparent that what the boss wants, our city shall receive! Embracing the old and the new, the headquarters will be comprised of two existing warehouses connected via skybridge to a new 292,000-square-foot structure certain to leave a lasting architectural mark along Fort Point Channel. The 12-story building will be shrouded in an arching, solar-powered roof while, at street level, visitors can enjoy an expanded Harborwalk, coffee shop, and bistro. “Our headquarters is designed to engage and leverage the talent, technology and work ethic of Fort Point and greater Boston, while also giving back to the community through investment, rehabilitation and an inviting public space,” said Ann R. Klee, head of Boston Development and Operations for GE. This will be evident in the campus’s classrooms for startups as well as high school and college students interested in STEM careers. Further, the development will include “convener space” for GE and community events, a co-working area for guests, and lab space for 6-12 early stage life sciences companies to develop innovative, co-created products. There will even be an innovation and exploration center to highlight GE’s history. 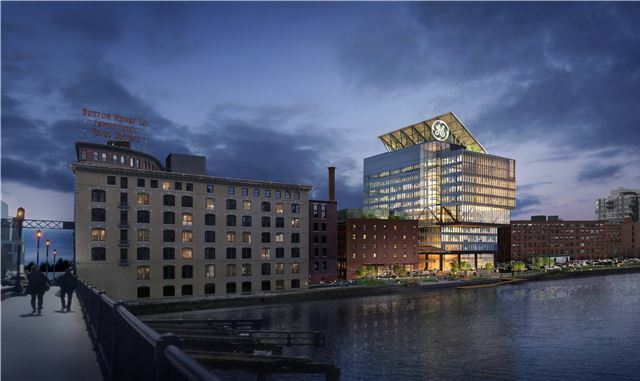 GE will soon get to experience what we at the Seaport have known all along: the Innovation District is the place to be! While the campus will house 800 employees, there will only be thirty parking spaces, so nearby South Station and Hubway bikes should expect to see an uptick in use—a green measure we fully support here at the hotel. Construction will commence later this year, and employees should expect to be able to fully utilize the space by the latter part of 2018. Welcome to the neighborhood!